Tyler is 3 in this picture. 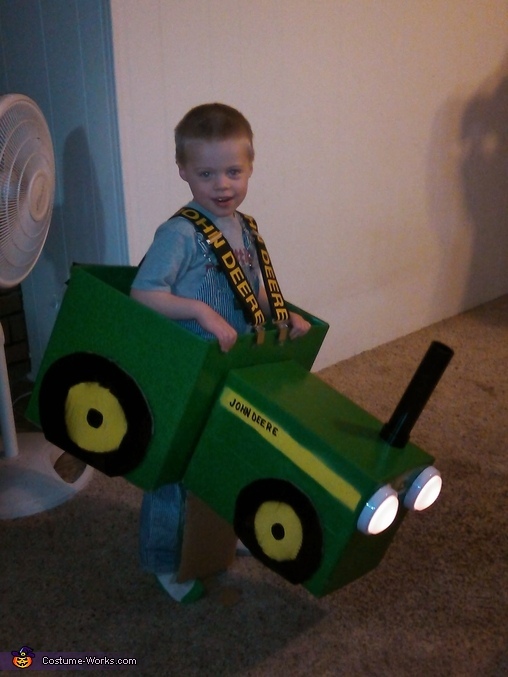 He wanted to be a John Deere tractor and I wasn't going to spend $50 on a costume. I found 2 boxes and glued them together. We had actual John Deere paint, my husband worked for a John Deere dealer at the time, and pasted the boxes. I purchased mini tap lights and screwed them on. We used suspenders to hold it on. Candy went into the smoke stack and cut a flap on the bottom of the box so we could empty it. Someone had drove by us while we were trick or treating and when we got to her house she had to have her dad come and look becuase it was the costume she was telling him about. We did hear from a few people that it was the wrong color...if it's not red leave it in the shed! My son wore this until it fell apart he loved it so much!